Michelle Michimani Leyva remembers asking her high school Spanish teacher if she could use glue and recalls how her teacher admonished her for using slang, rather than more formal language. “After that, I felt my Spanish wasn’t up to par,” she said. Although born in Puebla, Mexico, Michimani Leyva grew up in Phoenix and realized her knowledge of her native tongue could be better. At St. Mary’s University, Michimani Leyva (B.A. ’18) was an English-Communication Arts major, served as editor of the award-winning student newspaper, The Rattler, and completed several prestigious advertising internships. Never forgetting her high school Spanish teacher’s admonishment, she decided to earn a language certificate in Spanish too. One of her St. Mary’s Spanish professors took an interest in her future, encouraging Michimani Leyva to consider following her natural interest in linguistics. With the support of her professor, Meghann Peace, Ph.D., Michimani Leyva registered for every linguistics course she could and declared Spanish as a minor, before realizing she was close to double majoring. In Spring 2015, Michimani Leyva completed a research project, Lexical Variation in Spanish Speakers, inspired by her high school experience. Although the project was excellent for an undergraduate course, it wasn’t quite ready for an international conference — so Peace encouraged Michimani Leyva to continue developing her research. “I wanted to show through my research that there are different variations for the words that we use and to not see them as an educational deficiency, but instead have people embrace them because they are a form of your ethnic identity,” Michimani Leyva said. Michimani Leyva’s work was accepted as a presentation to the Third International Conference on Heritage/Community Languages at the University of California at Los Angeles this spring, and it earned first place in the field of Humanities at the St. Mary’s University 19th annual Research Symposium and Creative Activities Exhibition. 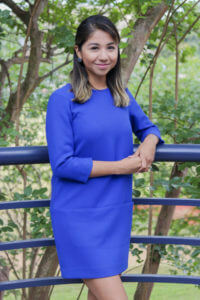 The Linguist List, an online hub for academic linguists worldwide, has named Michimani Leyva as its inaugural Rising Star — undergraduate students nominated by their mentors. Last summer, Michimani Leyva also obtained a competitive fellowship with the Multicultural Advertising Intern Program (MAIP), a 22-week program that allowed her to work in New York with Wavemaker, the second-largest media agency network in the world, where she worked with the company’s accounts for IKEA, Tiffany & Co. and Paramount Pictures. She planned to follow her May graduation with a MAIP fellowship with Starcom Worldwide Inc., one of the largest media networks in the world.